The first time I went to a Renaissance Festival, it was solely to earn dad-points. My wife and I took our kids to the Carolina Renaissance Festival, and by the time we’d strolled through the village, arrived at the joust, and watched the performers battle, I had a sneaking suspicion I was thoroughly enjoying myself. For the next few years I pretended like going was a burden, but kept agreeing to tag along. You know, just to be a good father. Always, it just so happened I could sneak away from work on whichever day they were going. And if they changed their minds and wanted to go some other day, well holy mackerel, I was free then, too. The year I came out as a full-fledged Renaissance festival nerd; I had an appointment I couldn’t reschedule, but as soon as it was over I sped halfway across Charlotte just because I wanted to catch an act called Barely Balanced. I’m a sucker for fire-juggling, and this trio does it all together while they stand on each other’s shoulders. That’s not nearly their best stunt, but describing the others won’t do them justice -- you have to see them for yourself. Any day I eat meat off of a stick is a good day. That’s the thing about Ren fests: Over a million people go nationwide every year, but unless you’re one of them, you probably don’t get it. It’s not just for kids or enthusiasts of Elizabethan England. “Because it’s fun” isn’t a convincing enough reason to go, so I did some research, interviewed participants and organizers, and eavesdropped on people at the Ren fests in Charlotte and St. Louis. 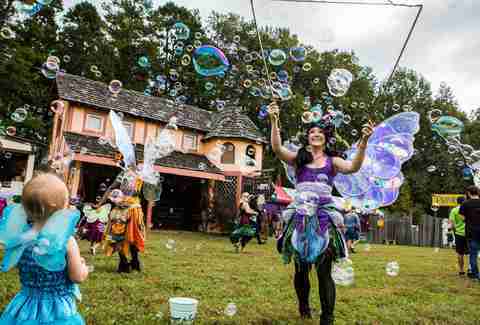 There is almost definitely a Renaissance festival happening near you, and here’s why this is something you need to let into your life. First of all, jousting is the coolest. You are never too cool for jousting. As a whole, I think jousting is endlessly entertaining. What the performers do is completely bonkers -- and it’s not even staged. I mean, how long does it take to learn that stuff? And how do you make it a full-time job? 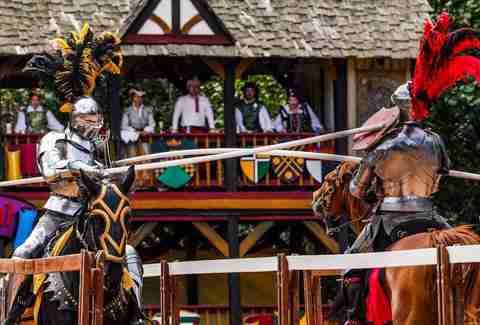 Matthew Mansour has worked as a jouster at Renaissance festivals for 30 years. He travels 46 weeks of the year, spending two months at each of five festivals. 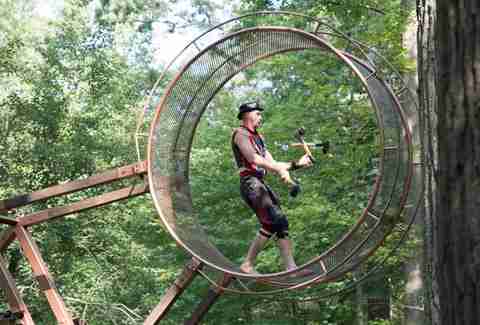 (He’ll be at the Carolina Renaissance Festival near Charlotte through November 18.) He wears more than 100 pounds of gear, including a metal helmet with only slits to see through. While riding no-handed on a horse named Alex going 20 miles per hour, he can catch something the size of a wedding ring using a jousting pole. Not every time, mind you, but doing that even once is frankly ridiculous. The jousting part of Mansour’s show is legit; they keep score, and nobody knows who will win. Only the “fight to the death” after the final competition each day is staged. It’s the rabid fandom around the competitions that pushes jousting to the next level. If the obsessive tracking sounds like Moneyball, it’s because it is. Call it Moneyjoust. “The thing is,” Mansour adds, “it’s something you can’t see anywhere else. The food is not great... but it’s sooo great. 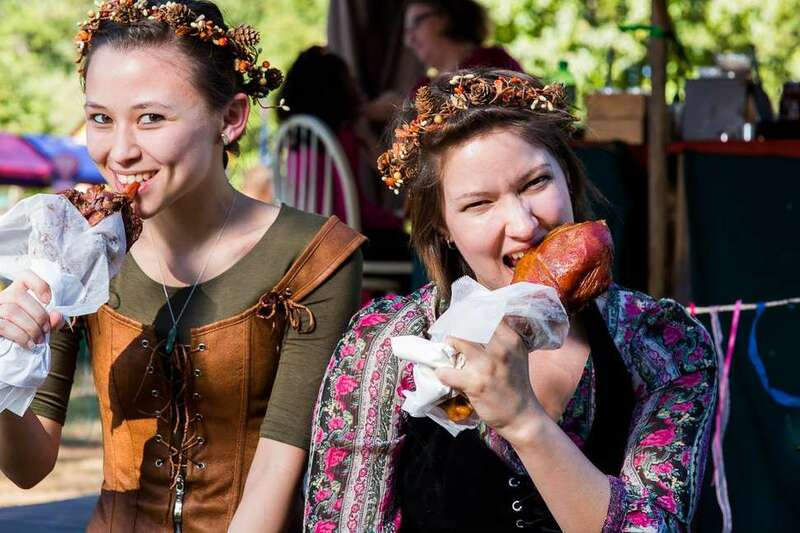 I have to be honest here: the experience of eating at a Renaissance festival is often far better than the actual taste. It’s like grabbing lunch at a food truck -- and not one of the awesome variety you find in Austin, for example. The steak kabob I bought this year at the St. Louis Renaissance Festival didn’t have any flavor. It needed to be either salted, or thrown away and replaced with better steak. But still, any day I eat meat off of a stick is a good day; if it happens to taste good, that’s just a bonus. 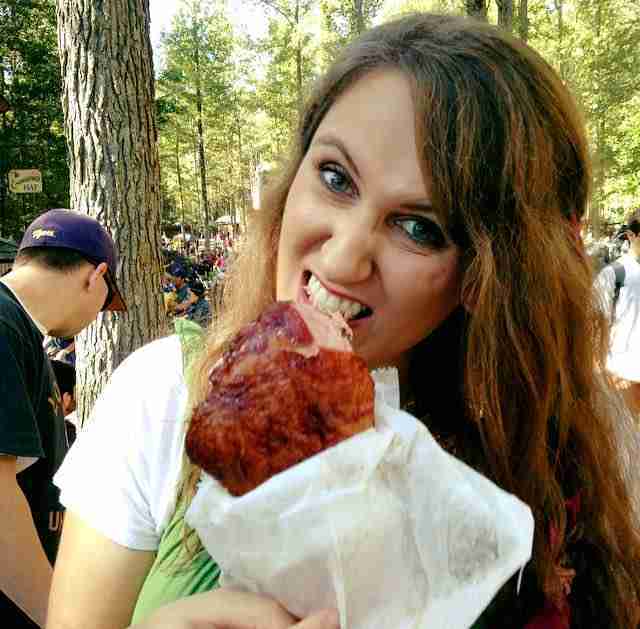 To make up for the underwhelming kabob, I also ate a turkey leg, a giant, skin-covered blob of salty, succulent goodness. Full disclosure: My daughters completely disagree with my assessment of the food and would not hesitate to Medieval-torture me for the deep-fried mac & cheese bites they crave every year. I shudder to think what they’d do for deep-fried Oreos, which, delicious though they are, might be the least Renaissance-y item there is. You really do learn interesting stuff on the sly. Now for the nerdy bits: The Renaissance is a fascinating period of history. It was a time of massive creativity and technological advancement, during which Martin Luther, Michelangelo, Johannes Gutenberg, and Leonardo da Vinci, to name just a few, changed the world. Western culture wouldn’t be where it is now without it. Many Americans trace their heritage to Europe, and Renaissance festivals are a way to connect with your personal history in a way that goes beyond a flat, facts-only family tree. 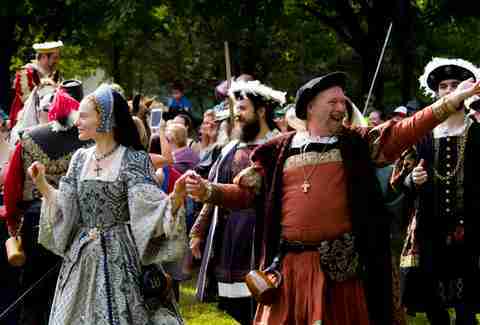 For example, the St. Louis Renaissance Festival has a German focus. My daughters and I took a brief class on how to handle a pike, a long stick with a blade on the end of it that Germans used to beat the snot out of whoever the enemy du jour was. You get to gamble and play with swords, and pass it off as educational. In addition to the pike lessons, we all learned how to make rope, how to play an old German dice game, and how to use various other medieval weapons. Not to put too fine a point on it, but at a Renaissance festival, you get to gamble and play with swords, and pass it off as educational. There’s usually some Game of Thrones thrown in, too. Some Renaissance festivals care deeply about authenticity, and the performers strive to get everything historically correct, right down to the buttons and stitches. Others take a looser approach, and soak their festival through with the fantastic, whether it’s mermaids or fictional characters or vaudeville acts that have nothing to do with Elizabethan England. The live entertainment also mixes the authentic and fictional. Take the acrobatic performance by Jaime Zayas and his wife, Vanessa, in St. Louis. Zayas considers himself, first and foremost, a clown. There were court jesters in the Renaissance, a close cousin of clowns -- but there weren’t trapeze performances or silks hanging from cranes, both of which Jaime and Vanessa use in their act. Another part of their act is juggling, which Zayas told me has existed since ancient Egypt. Of course jesters juggled during the Renaissance. They definitely didn’t do it hanging upside down from a trapeze though, as Zayas does. “How does that even work?” you might wonder. Well, Zayas says that if you can juggle by looking up and throwing balls at the ceiling, the technique is much the same. It took a lot of practice -- if the trapeze starts moving, he has to adjust his throws and catches -- but now it’s a regular part of his act, alongside his jokes and acrobatic stunts. Who doesn’t like to dress up? Many, but not all, Renaissance festivals are held in the fall, a season when wearing outlandish costumes is perfectly acceptable, even encouraged, and also weather-appropriate. When I went to St. Louis’ festival recently, dressed like the suburban dad that I am, I felt like the only schmuck wearing normal clothes at a costume party. Some people wore authentic period dress, or at least earnest attempts at it; others looked more like Game of Thrones extras, or people who take Halloween very seriously. I wonder how many of the swords I saw swinging from people’s hips were real. In any case, I’m pretty sure the people who dressed up had more fun than the people who didn’t. And I don’t want to get all mopey about the current state of badness in American society, but, Renaissance festivals allow us to escape. We can dress up and imagine we’re in a far-off time and place when news traveled only as fast as a horse could carry it. As Mansour told me, when he looks in the stands while performing during the joust, people are looking at him -- not at their phones. Matt Crossman is a contributor to Thrillist.